Joseph Ruben’s Dreamscape (1984) is a science-fiction action movie that involves psychic researchers entering the dreams and nightmares of their patients and becoming “active participants” in them. 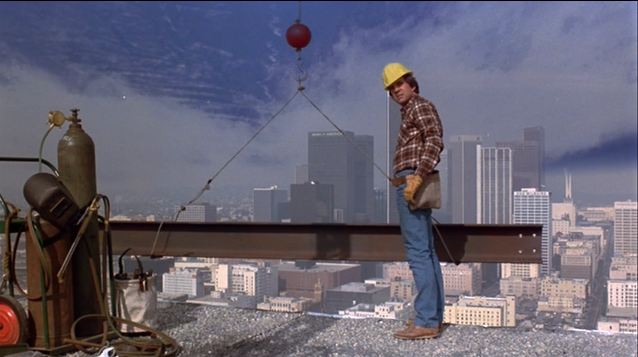 The thirty-year old film shares some qualities in common with Douglas Trumball’s Brainstorm (1983), but is ultimately not as dazzling in terms of its special effects or imagination. 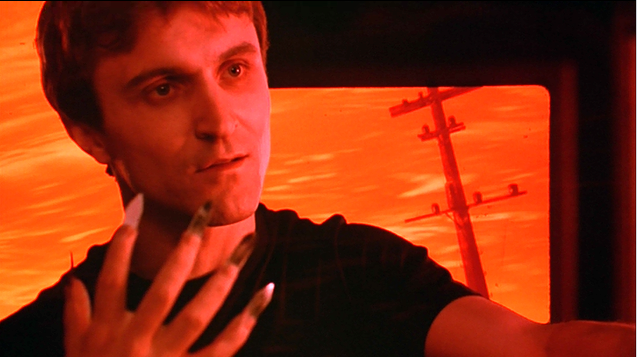 Perhaps more to the point, Dreamscape also features many plot-points -- including a man with finger-knives – that appear in Wes Craven’s masterpiece, A Nightmare on Elm Street (1984). But where Brainstorm and A Nightmare on Elm Street approach their subject matters with a sense of gravitas and seriousness, Dreamscape often descends instead into silly action clichés, and features chase scenes (on motor bikes, no less…) instead of any consistently-applied leitmotif about the nature of the human subconscious, or the power of dreams. These facts established, Dreamscape is very much a product of its turbulent time, and it expresses beautifully the “apocalypse mentality” of the 1980s Cold War Era. Lest we forget, this was the age of The Road Warrior (1982), War Games (1983), and The Day After (1983), when fears about nuclear Armageddon ran high in the nation. Russia had invaded Afghanistan in early 1980, and President Reagan began his administration as a hard-line Hawk. Remember, President Reagan -- in addition to being a peacemaker with the Soviet Union in his second term -- was initially the fellow who joked on a live mic that he had outlawed Russia and that we would start bombing it in “five minutes.” He was also the leader who said that the Soviet Union was an “Evil Empire,” and that -- once launched from submarines -- nuclear missiles could be recalled. Such statements, in conjunction with right-wing debates about “winnable” nuclear war, created an atmosphere of fear. When you coupled these comments with Secretary of the Interior James Watt’s comments that we were living in the “End Times”…things got really scary. I grew up in the 1980s, lived through these times, and heard -- as a boy -- quite clearly the comments politicians were making about our planet’s future. I went to bed many a night in those years worrying about nuclear holocaust and wondering if I would live long enough to attend college, or get married. Dreamscape connects with such fears very well. Today, we are all fortunate indeed that President Reagan underwent a re-think of his policies -- similar to the one the president of Dreamscape undergoes -- and became such a committed “warrior” for peace in his second term, going so far, even, as to walk-back his “Evil Empire” statement. 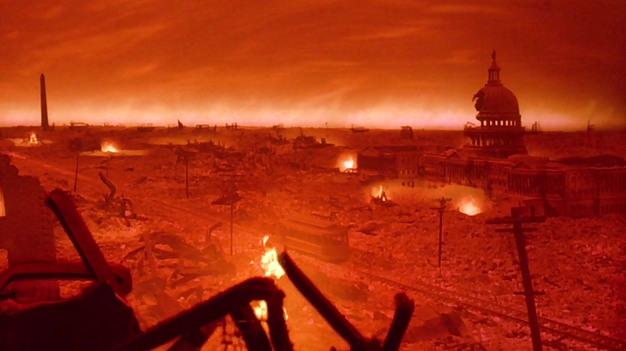 But the point is here is not politics, rather that this very 1980s apocalypse mentality context finds terrifying visualization in Dreamscape, and that the moments concerning nuclear war remain the film’s most powerful and resonant. 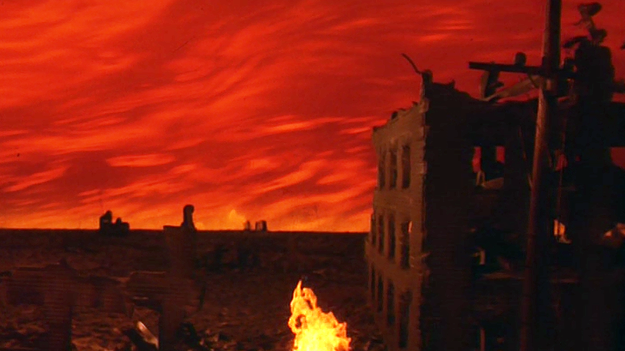 Throughout Dreamscape, we see mushroom clouds, hideously-scarred children, and a burned-out crimson landscape function as symbols of man’s self-destructive ways. At one point, a President who blames himself for nuclear war takes a train tour through the apocalyptic landscape, and spies the ruins of the capital building. America -- that shining city on the hill -- is in ruins because two countries couldn’t see to get along, or to cooperate peacefully. 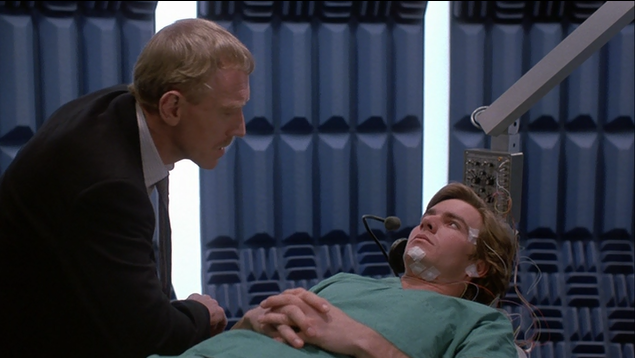 For all its goofy lightness and ho-hum concentration on action and romance, Dreamscape actually works best as a science fiction film when its phantasms grow darkest; when they deal bluntly with the national “dread” of nuclear war rather than the personal, subconscious fears of specific patients. Dreamscape could have been a great film about the biggest fear of an epoch. Instead, it’s just a mediocre film that never quite lives up to its incredible potential. The U.S. government recruits a small-time con artist and psychic, Alex Gardner (Dennis Quaid) to work at Thornhill College’s dream research center, located in the Bates Building. Dr. Jane DeVries (Kate Capshaw) and Dr. Paul Novotny (Max Von Sydow) train Alex to psychically-link with dreaming patients, including a construction worker with a fear of heights and a boy, Buddy (Cory Yothers) suffering from nightmares of a snake man. Alex is successful in treating both patients, and helping them overcome their nocturnal fears. At the same time, however, Alex’s success fosters resentment in another dream “traveler,” Tommy Ray Glatman (David Patrick Kelly). In addition to being psychic, Tommy is a murderer, a trait which comes in handy when shadowy government agent Bob Blair (Christopher Plummer) approaches him with a secret assignment. 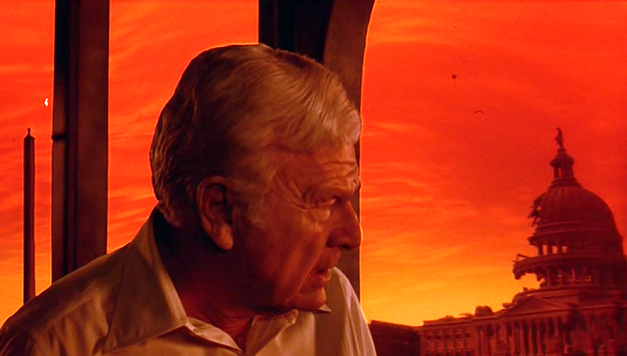 Specifically, the President of the United States (Eddie Albert) has been suffering from dreams involving nuclear apocalypse, and Bob fears that he will give away America’s nuclear store at upcoming peace talks with the Soviet Union. To prevent this eventuality, Bob orders Tommy Ray to enter the Commander-in-Chief’s dreams…and assassinate him. To the rest of the world, it will appear that the President simply died of a heart attack in his sleep. Alex learns the truth about Bob’s plans, however, and -- without the aid of instrumentation -- also enters the President’s dream to confront Tommy. Although decidedly not a great film, Dreamscape perhaps deserves a little credit for two things. First, it expresses perfectly the “apocalypse mentality” of its time, as noted above. The president’s recurring dreams of apocalypse are strongly-visualized by Ruben. The film opens with them, in fact, as the President’s (deceased) First Lady attempts -- and fails -- to outrun a nuclear mushroom and shock wave. 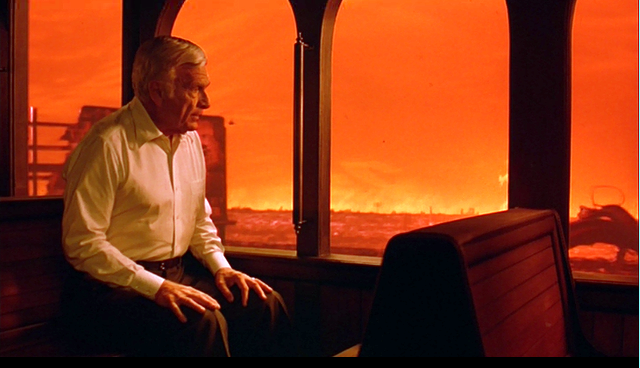 Later, the President (in another nightmare) tours the post-apocalyptic landscape in an ornate train car, and he gazes out across the barren, blood-red landscape. Out on the ruined land, we see the Capitol building, and the Lincoln Memorial. Importantly, this vision of the President on a train, observing the land, calls to mind the American tradition of presidential whistle-stop tours. Only here, a leader surveys not a beautiful land of plenty and a happy populace, but a ruined land of death and desolation. 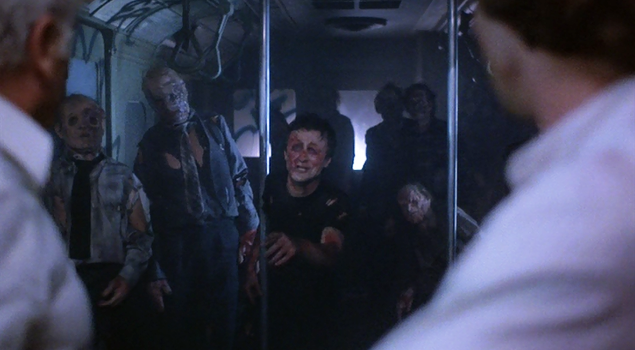 Yet another nuclear vision is powerfully wrought in Dreamscape: Alex and the President end up in a subway car of scarred survivors, and that packed, modern car contrasts perfectly with the ornate old-fashioned presidential train. It’s as if this old, set-in-his-ways President cannot quite think in modern terms, and so out of misguided notions of patriotism and peace through strength, he leads the contemporary nation -- a nation of subways and commuters, not romantic whistle-stops -- into ruin. Secondly, it should be noted that Dreamscape actually predicts real-life world events to a large degree. On the latter front, Eddie Albert makes for a very Reagan-esque president a gentle-seeming, avuncular older man. His terrifying dreams of nuclear annihilation lead him to re-think his policy about the Cold War, and he plans to negotiate with the Russians at an upcoming summit in Geneva. But by doing so, the President provokes an insurrection or rebellion on his right flank. Hawks in his administration, including Blair, are afraid he will give up the nuclear store and simply “appease” the Russians. This is almost precisely what happened in real life, in 1985. First, President Reagan experiences his conversion about nuclear war. But that conversion arose not from personal dreams or nightmares, but rather from a viewing of The Day After, allegedly. When Reagan softened his hardline stance regarding the Soviet Union, in anticipation of – again -- a Geneva Summit, members of his administration rebelled. Secretary of Defense Caspar Weinberger, for instance, wrote a letter to the Washington Post urging President Reagan not to give up any bargaining chips, and not to appease Gorbachev in any way. The letter was made available to the press on November 16, 1985. Fortunately, no one attempted to assassinate President Reagan as he transitioned from “cold warrior” to crusader against nuclear war. Once more this is the journey Albert’s president takes in Dreamscape. 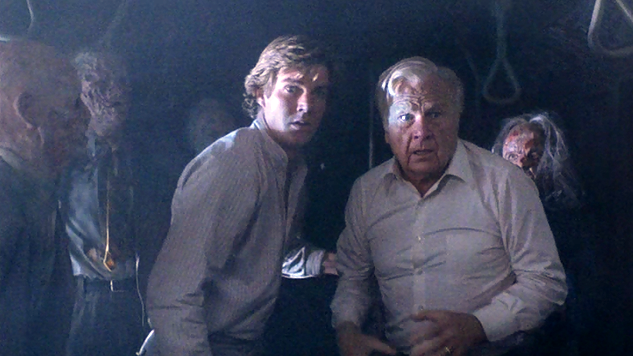 There’s one another effective scene in Dreamscape worth discussing, though it is off the subject of the 1980s apocalypse mentality. Alex journeys inside Buddy’s dreamscape, and encounters a world straight out of German Expressionism, at least if we take the angles and compositions into effect. In this world of cockeyed, jarring angles, Buddy asks his father to save him from the Snake Man, but the father is out to lunch, and can’t -- or won’t – help him. 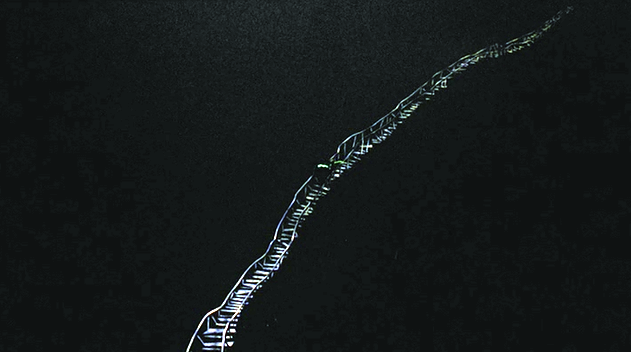 So Alex runs with him, and they descend through what looks like infinity itself, on a suspension staircase surrounded by blackness. 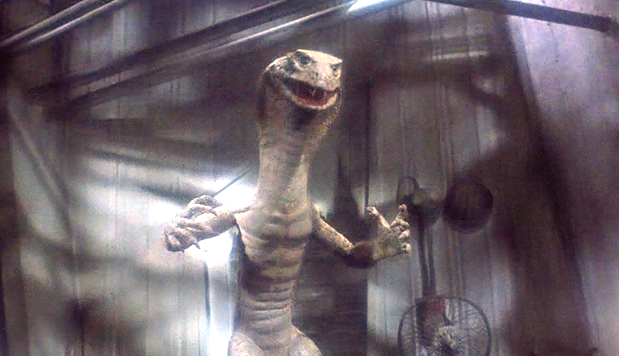 Despite some bad stop-motion photography involving the Snake Man, this night terrors scene is effective because it speaks legitimately in the language of nightmares. In our nightmares, we are all children in a sense -- alone and vulnerable -- and our imaginations run wild, unfettered. 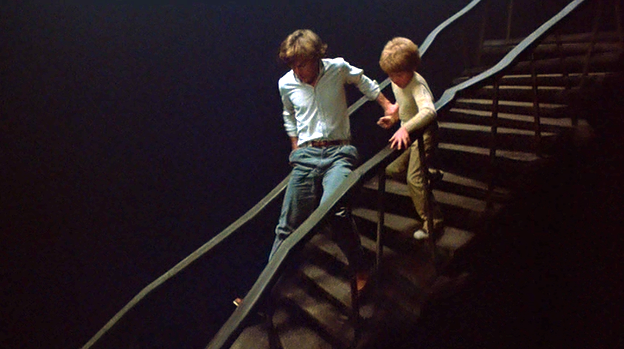 Between the expressionist angles, the snake man, and the dizzying descent, down and down, Dreamscape effectively visualizes this idea, as well as the notion of parents who somehow can’t help us. In dreams, we’re always on our own…unless Alex Gardner shows up. 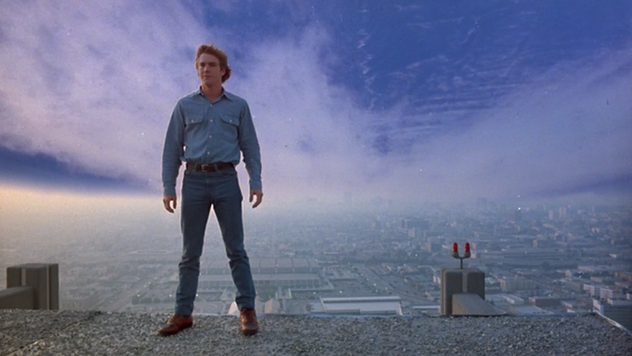 Given such successes, it’s a shame that Dreamscape isn’t a better film. All the material involving Alex getting pursued at the race-track by small-time hoods is a waste of time, and even the romantic angle with lovely Kate Capshaw seems to diminish the film. For the most part, the film feels light and inconsequential, rather than searing or sharp. Except for the moments in Buddy’s nightmare, or on the President’s post-nuclear landscape, Dreamscape feels jokey and kind of dim-witted. I should preface my next remarks by stating that I have no idea how this occurred, but Dreamscape also ends up aping, relentlessly, A Nightmare on Elm Street. 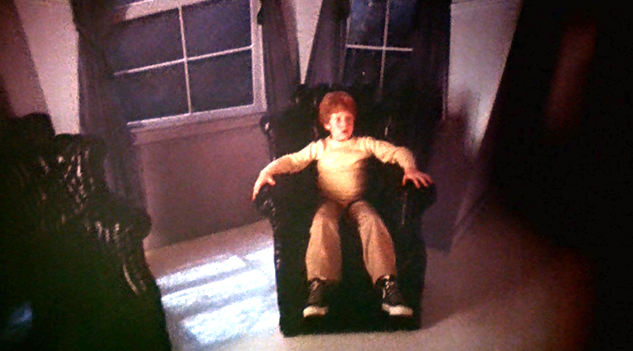 Dreamscape was released first, but Craven’s script made the rounds in Hollywood well before either film was made. Spontaneous creation does happen occasionally in Hollywood, but there is certainly something fishy about the narrative overlap between films. Both efforts, for instance, feature scenes set at dream clinics, where scientists discuss the nature of REM sleep and dreams. Both films find the opportunity to discuss the Malaysian Dream People. And it’s impossible not to notice that Tommy Ray sprouts finger-knives at one point, or that the Snake-Man battles Alex in what looks like a hellish boiler room…Freddy’s digs. Again, I cannot and would not assert rip-off or plagiarism without further knowledge of the facts. But I will state this: All the moments of similarity carry less psychic weight and impact in Dreamscape. In other words, the moments discussing the Dream People or REM sleep feel casually dropped into Dreamscape, as if to give it a veneer of respectability or legitimacy, whereas in A Nightmare on Elm Street, all those elements tie together brilliantly with other aspects of the story. For instance, in the Craven film the Malaysian Dream People are discussed because they turn their backs on Evil, and that’s the very thing that Nancy (Heather Langenkamp) -- ever the digger (hence the film’s comparison to Hamlet) -- has trouble doing. Accordingly, it’s much easier to make a case for the validity of these concepts in Nightmare than it is in terms of Dreamscape, even though Dreamscape arrived in theaters first. Dreamscape is one of those films from your youth that you probably remember fondly. Alas, I found that the fond memories are erased a bit in modern re-watch. The film features powerful nightmare imagery, but instead of exploring it fully, wants to waste your time on car chases and bike-chases, and fisticuffs. The movie strenuously avoids trying to be about the thing it is supposed to be about: the subconscious mind. Thus Dreamscape’s approach is not the stuff that dreams (or good science fiction movies…) are generally made of. Excellent post. 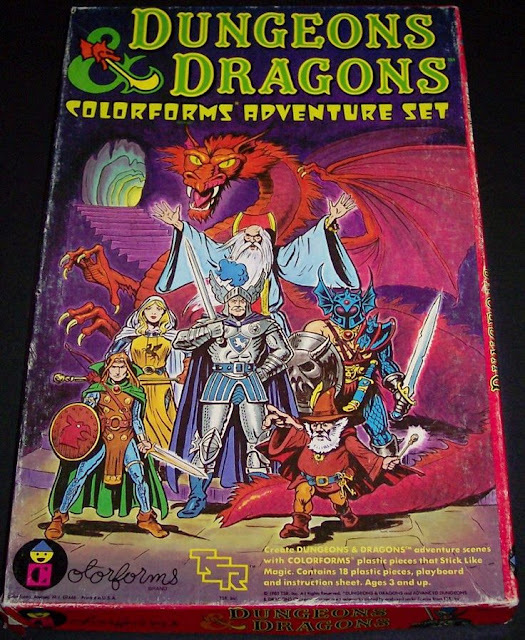 Saw this back in the day and dug it, but had not thought about Dreamscape in some time. 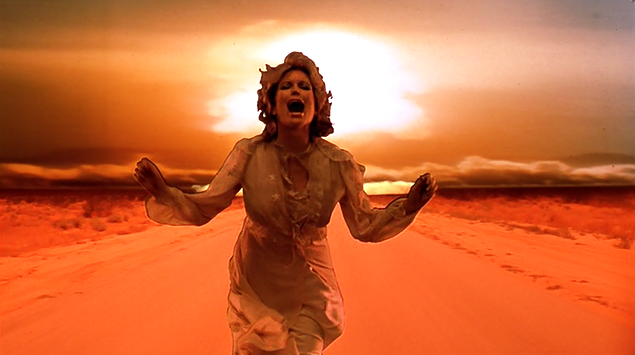 I always took the reason that the ravaged landscape and Bobby's dream looked more real to be a clumsy attempt to have the dream world be more real than the real world. Dreamscape has always been one of my favorite movies. Very creative in places, always fast paced, believable (this is important as I am a theoretical physicist) and well cast. I disagree with the criticisms above, looks like the writer has a checklist rather than creativity.